I had every intention of posting today with my new photos that I took last night, but the photos were never picked up. My husband is having a medical procedure done tomorrow and I have a show on Saturday. Needless to say between all the running around today, tying up loose ends and picking up last minute things, the photos were forgotten. But you'll be happy to know that the Cirque Lion will make an appearance! Finally. I've been so wrapped up in getting pieces done for the show and making sure my husband doesn't have to do anything but show up tomorrow that time has just slipped by me. I went up to Mt. Dora in Florida on Sunday to the antique fair. Was expecting to see way more dealers than there were, it had fallen off quite a bit. The buyers weren't really there either, but that just gave me more elbow room and ease in which to look. 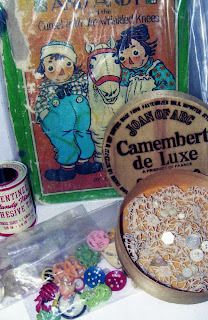 And lucky me I was able to find a vendor who offered the most wonderful buttons from the 1930's. I got a rather worn copy of Raggedy Ann and Andy & the Camel with the Wrinkled Knees, but aside from a few crayoned spots the illustrations inside are mostly intact. So, a happy adventure and the' new' circus buttons will make an appearance soon! Not for Kermit anyway. This week is Earth day(April 22) and Arbor day(April 24) and I thought you like to know how we bear artist are being green. 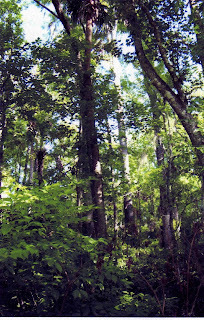 Reduce - We reduce the amount of fiber goods being added to landfills, that's old clothing old furs etc. ( we can't recreate the lost lives but we can make something good out of something sad).we reduce the amount of energy used by carpooling to shows and sharing rooms. We use less fuel (not counting side trips to fabric and antique stores along the way). Reuse - When something doesn't work an artist is the first to take it apart and make it into something else. We reuse displays, packing boxes and our patterns that we change and adapt. Recycle - We use and re-purpose previously owned materials(antiques) in our products. 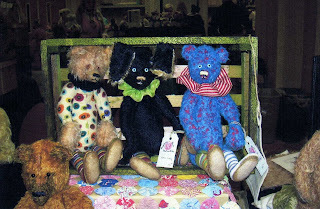 Old coats are turned into bears or bear clothing, even the linings are used, and old books are turned into research libraries to inspire new designs. We pick up what others don't or won't use and make it useful again, wanted again and beautiful again. That picture is taken from the trail near my house, and that view is why we do what we do, it's not easy being green but it sure is worth it. Save a tree, save a planet. Well, this is the day of scramble, don't give it up till the last minute, go to pay taxes day! Ok, I did mine on Friday, my sister did hers on Monday and yesterday found a mistake and fixed it so they would go out today. Easter has always been a freshness for me. Tulips blooming and daylilies bright with color. There were crinoline slips, itchy and wide that made little girls dresses stand out , worn with white socks, white gloves and black patent leather shoes. White straw hats topped freshly pressed hair done up in 'Shirley Temple' curls. There was the curled up palm frond pinned to your bodice on Palm Sunday and the rehearsals for the Easter play. But underneath it all was the newness and even an eight year old girl knew that it had nothing to do with a new dress but everything to do with a new awakening, a new life, a new chance. It's in the air, this opportunity to take a new chance, on life, on you. 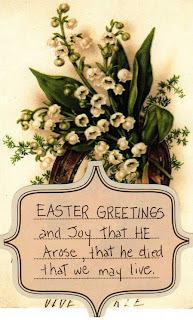 Happy Easter to you and yours...begin again. 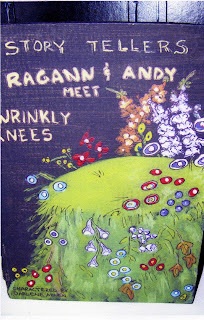 Thought you would like to see another in the Story Tellers series, 'Ragann & Andy Meet Wrinkly Knees'. This piece is available from the Toy Shoppe. Check out their website for other bear artists. Hope you're having a great day, the bears and I are at home .... relaxing. While the show did not have as many collectors as usual there were new collectors attending . 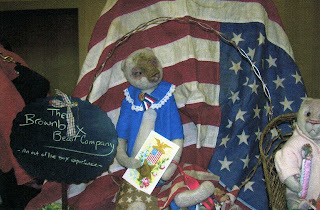 those that came were happy to buy bears and visit with artists and collectors alike. It was a good show. 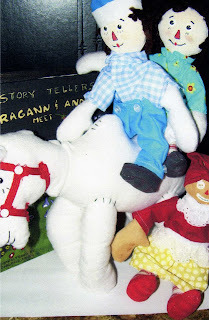 That's Ginger Brame with the puppet bear she just sold and some of her other bears at the right of her. 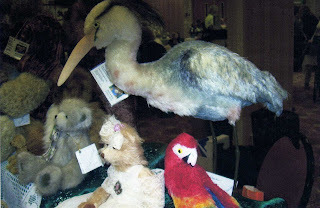 Cindy Malchoff offered some fine feathered friends along with her cute bears. 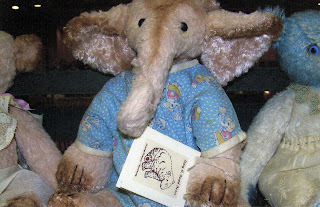 Mary Dowd offered the cute little elephant in blue but it didn't last long before a collector fell in love and snatched it up. 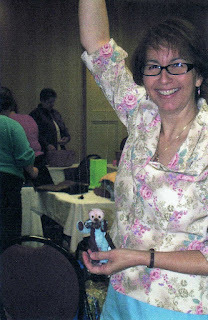 Melissa Glidden offered these felted sweeties. She does very interesting work so please click on her name to see her website. 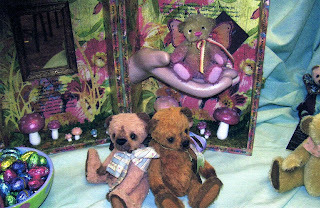 Her company is the Brownbox Bear Company. How the bears and I spend time at home and what happens at bear shows. Come visit awhile.